The third book in the Flying Broomstick series is here! Order today! The long-awaited third book in the Story of the Great American Flying Broomstick series is here. 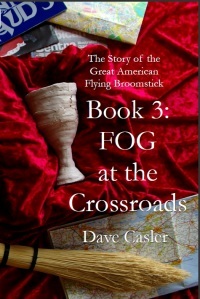 Entitled FOG at the Crossroads, it tells the amazing story of the loss and recovery of the Holy Grail. The official launch date is Saturday, October 3rd at the Regional Mensa Convention in Reno, Nevada. I’ve been invited to give a 90-minute talk about flying broomsticks, similar to what I presented at the 2008 Mensa National Convention in Denver. But you can order the book today. Check it out and order today. See our catalog for order information.